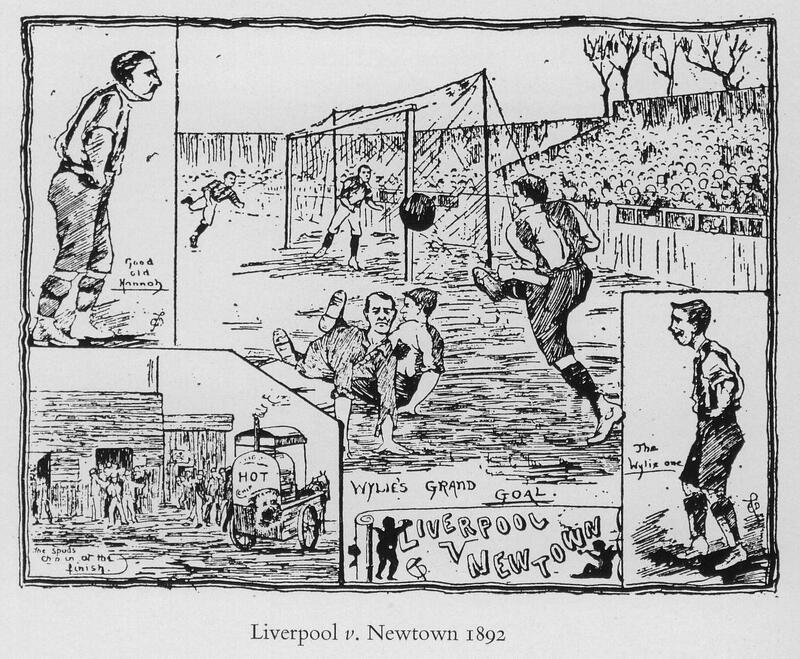 Liverpool v Newtown 9-0 (FA Cup: October 29, 1892) – "Play Up, Liverpool"
Match: FA Cup, Second Qualifying round, at Anfield, kick off: 15:00. Referee: Mr. W.H. Gough (Liverpool); umpires: Messrs. Gunning and H. Owen. Liverpool (2-3-5): Sydney Ross, Andrew Hannah (C), Duncan McLean, John McCartney, Matt McQueen, James McBride, Thomas Wyllie, John Cameron, John Miller, Malcolm McVean, Hugh McQueen. Newtown (2-3-5): A. Edwards, Oliver Taylor, Alfred Townsend, Henry Tucker, Tom Chapman, E. Rees, William Pryce-Jones, E. Evans, Tom Worthington, J. Thomas, W. Morgan. The goals: 1-0 McCartney, 2-0 Wyllie, 3-0 own goal (Townsend), 4-0 McVean, 5-0 McVean (66 min. ), 6-0 Wyllie, 7-0 H. McQueen, 8-0 Wyllie, 9-0 Cameron. The match vs. Newtown at Anfield. Looks like Liverpool’s sixth goal, from Wyllie, is scored towards the Anfield Road-end. Next Post: Liverpool v Newtown.